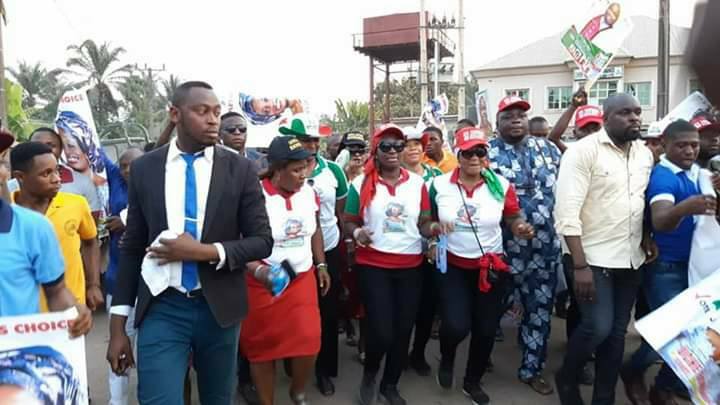 Senator Uche Ekwunife’s tour of the communities in Anaocha local government came to a climax as the Candidate of the People’s Democratic Party for Senate Anambra Central arrived her country home Nri on Tuesday. The event was filled with spectacles and fanfare as Nri people came out en mass to welcome their amiable wife. It is important to note that Senator Uche Ekwunife who is happily married to Chief Larry Ekwunife from Nri has impacted meaningfully to the growth of the community. Ekwunife who was welcomed by the President General, Ndi Nze, Ndi Iyom, the women and the youths of Nri amidst songs and chants described her visit to Nri as a homecoming. Welcoming Senator Ekwunife, the President General of Nri Progress Union, Chief Obiegbunam Kelvin Chiedozie (Oba Ochendo) thanked Nri people for coming out in their numbers to welcome their wife whose impact to the socio-economic development of Nri is visible. Oba Ochendo stated that he is not surprised at the level of support Senator Ekwunife is getting in Nri and beyond. He described her Senatorial bid as a project Nri people should take seriously, noting that Ekwunife has made Nri community proud. “As a President General, I do not belong to any Political party, what is paramount to me is to see that Nri continues to progress. It is a glaring fact that Iyom Ekwunife has contributed immensely to the growth of our community and indeed other communities she has represented. We are proud of her, and we must give her all the necessary support”, Oba Ochendo said. 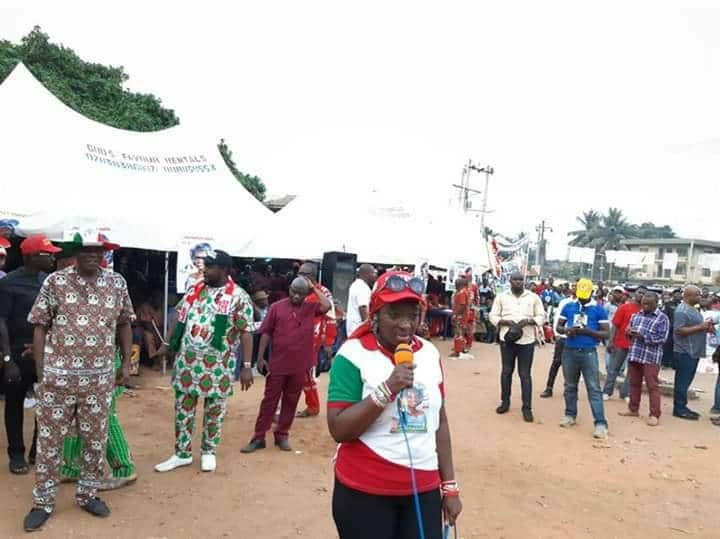 Giving her speech, the PDP Senatorial Candidate for Anambra Central, Senator Uche Ekwunife expressed gratitude for the rousing welcome she got from her people. She stated that her visit to Nri is not to campaign but to thank her people for the support they have given her over the years. Speaking, she said: “I’m elated to be in your midst today. In 2015 and indeed in all the elections I have contested, I have always enjoyed massive support from you, my people. However, the February 16th general election provides an opportunity for Nri to make a stronger statement not because I come from Nri but because in me you have found a daughter, a wife who has been tested and trusted. A wife who is committed to making you proud”. Speaking further, the PDP Candidate described Anambra Central Senatorial zone as a zone that is currently poorly represented. “The incumbent Senator lacks the legislative experience, contact and capacity to put our Senatorial zone in its pride of place. While in the Senate for six months I achieved great feats – one of my first tasks in the Senate was bringing the Senate committee on works to address the erosion menace that almost cut off the Nkpor flyover section of Enugu-Onitsha expressway. I sponsored two bills as Senator, one of which has been signed into law. As Senator, I attracted two alphated roads. Today, all I seek is your support to return Anambra Central to the path of quality representation”, Ekwunife said.